You know how sometimes you make lists of what absolutely must get done in the next 12 hours and what you end up with is something like this? Yeah. That's why you're getting a short post today. I just bought three pumpkins to not carve for Halloween (because drawing faces on and maybe hollowing out just enough nasal cavity to ram a carrot into the hole is so much faster.) This is news because usually I wait till a few days before, hoping to avoid a raccoon rampage like that one dreadful year when my scary decorations were pumpkin guts all over the yard. The downside: it's awfully hard to find a decent pumpkin that close to Halloween. This year I am ready, and the pumpkins are safely stowed in the garage. I also bought a ton of leaf bags. Those things are coming off the trees in droves now! 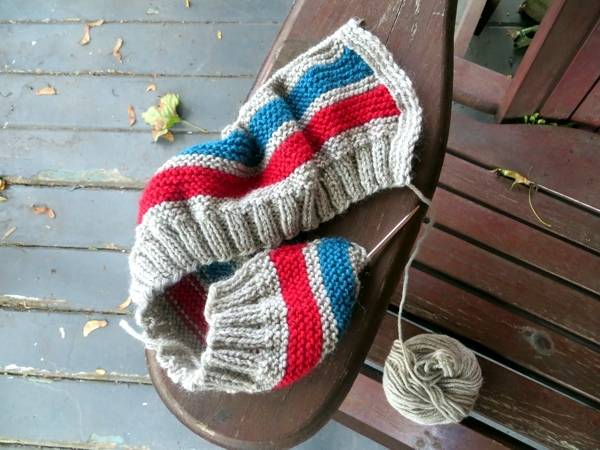 Knitting the garter stitch hat, I am obsessing about coordinating handwarmers to slip over my gloves for brightening up all the black that will be on me when any remaining leaves are tucked up under snow. The writing workshop is starting in a couple of weeks. I had a crazy idea about having a new pair of socks ready just for it, but then the stripey garter stitching happened, and on top of that there's the list I'm still ignoring. Probably it is crazy to think about those socks. And... I'm doing it anyway because sometimes knitting makes you stubborn. Just thinking though. Not really knitting, except for the times when I am knitting. ahem. What are you doing instead of being sensible today I wonder - or am I the only one?